Drones have become increasingly popular in the film industry. They are relatively easy to operate and give filmmakers the ability to make previously impossible scenes for their films. They are also cheaper than helicopter crews and other traditional forms of capturing aerial shots. Here are the top 5 drones on the market for cinematography based on price and features. Once you’ve chosen the perfect drone for your project, don’t forget to protect it with drone insurance. 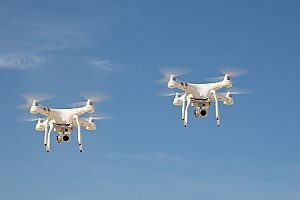 The DJI Phantom 4 Quadcopter can capture video in slow motion, making it a popular choice for filmmakers interested in creating special effects with their drones. It also comes with its own software, which allows you to easily edit film or add music and text to it. The drone’s Active Track feature allows it to follow subjects even without a GPS tracker thanks to the included app. Once the drone has locked in on its subject, it will automatically follow it at a safe distance until the feature is disabled. This model features an updated image quality thanks to reduced chromatic aberration and lens distortion, creating crisp videos and photos. The drone is also lightweight and includes a 32 GB memory card and gimbal clamp for immediate filming. The DJI Phantom 4 Quadcopter comes with a one-year extended warranty and is available for $1,280. The DJI T600 Inspire 4k Quadcopter is widely considered to be one of the best available drones in the business. The drone is the first one that was capable of filming in 4k and continues to be one of the top drones for stellar aerial images. The drone is ready to fly right out of the box and can live stream 720p HD images directly to a smartphone or tablet, as long as it has the accompanying app installed. The built in camera can record in 4K at 24 to 30fps or 24 to 60 fps at 1080p, but its gimbal system and camera are detachable for those who would prefer to use their own cameras for filming. It is also able to rotate 360 degrees, meaning that it can be kept in one spot to film a variety of angles without having to move the drone to each one. Thanks to the drone’s smart battery management system, operators will always know exactly how much of their 15 to 20 minute flight time is available at any time. The drone can transmit images up to two kilometers away and reach a height of about 1600 feet. Easily one of the top 5 drones on the market, the DJI T600 Inspire 4K Quadcopter comes with one or two controllers and is currently available at prices starting at $1,899. For filmmakers on a budget, the Parrot Bebop 2 is an excellent choice. The drone has 25 minutes of flight time and an altitude threshold of 200 meters, with a camera that can film in 1080p thanks to its 14 megapixel camera. Images are available in three formats, allowing filmmakers to choose from raw footage that can be edited later or ready-to-use images for quicker projects. The lightweight drone is only 500 grams, but still manages to stay stable in the air due to its aerodynamic design. It can reach speeds of 37 miles per hour when flown horizontally or 13 miles per hour when flown vertically without affecting the quality of your images. It can reach those top speeds in 14 seconds and come to a full stop in just 4, making for some dramatic shots. The Parrot Bebop 2 may be one of the easiest drones to fly. It responds to the movements of your smartphone or tablet in addition to touchscreen controls, helping just about anyone get started right away. The drone is currently available for $400, making it one of the top 5 drones on the market. This Xiaomi drone comes with its own 4K camera for high definition images. It can transmit those images directly to your phone through WiFi instead of an app, and transmits at distances of up to three kilometers. The drone also rotates 360 degrees for easy image capture. One of the most interesting features of the Xiaomi drone is the ability to pre-plan routes. Users can design a flight path prior to filming, then have the drone follow that path at the touch of a button for a truly hands-off filming experience that allows you to fully focus on the images and artistry of your project instead of worrying about proper flying. The Xiaomi Mi drone is currently available for $650 online. The Yuneec Typhoon H has six propellers for maximum stability while in the air. It comes with a 4K camera on a gimbal and offers 360 degree views. The drone also offers eight predesigned flight options, such as Orbit and Curved Cable, that can help you get the shot you need with minimal prior planning. Thanks to the included Intel RealSense technology, the drone is nearly crash proof. 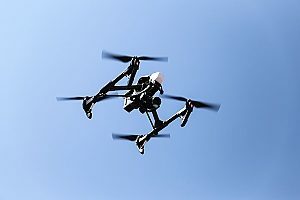 The technology allows the drone to analyze and remember its surroundings using GPS capabilities, helping it avoid obstacles and prevent damage. This drone comes with a one-year manufacturer warranty and is available for $1,200, which is well worth the price being one of the top 5 drones on the market. Drone insurance is just as essential as choosing the right type of drone, as failing to carry insurance could cost you and your company thousands of dollars in legal fees and repairing damages. Speak to a drone insurance agent for more information about how to acquire a drone insurance policy, especially for these top 5 drones on the market. MFE Insurance Brokerage provides a variety of insurance policies for you and your drone. Aviation liability insurance covers costs related to third-party lawsuits, including attorney fees and settlements, and may also cover an injured party’s medical expenses. The policy also covers fees related to the damage of property. Hull coverage policies, meanwhile, protect you in the event of damage to the drone, allowing you to easily repair or replace it. MFE also offers personal and advertising liability insurance, which protects against suits related to libel, slander, defamation, and invasion of privacy. Finally, medical payments insurance is available to help you pay for expenses resulting from coming into contact with a drone. Having these policies can help you avoid financial and legal stress, making them just as worthy of an investment as your drone itself. Previous Post: « Can I Insure My Drone Against Environmental Damage?